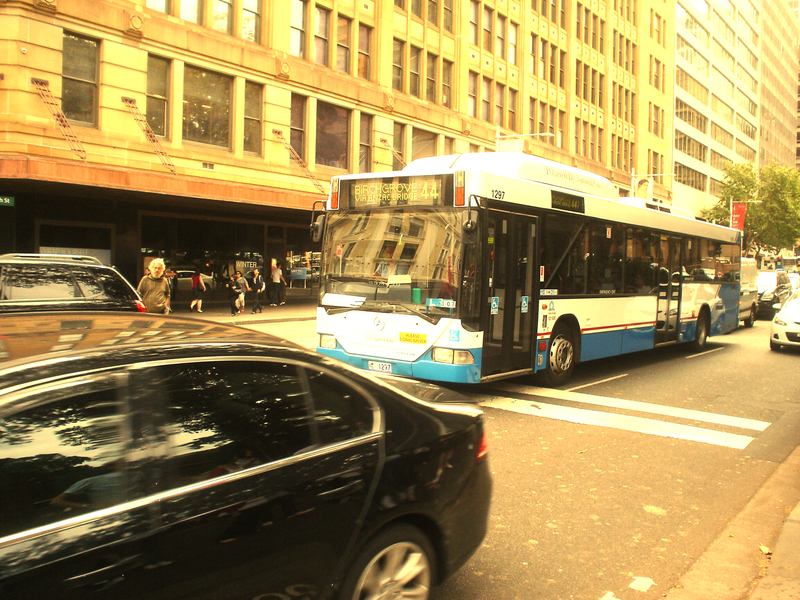 In recent years the traffic in Sydney has become heavier, more congested and sometimes downright dangerous. Drivers have to be more careful than they used to be, so do cyclists and so do pedestrians. Oddly enough, the group I find that is most reckless and least careful on the roads is the humble pedestrian, especially when it comes to zebra crossings. • Never assume that an approaching driver can see you or will stop for you, as their vision may be affected by the sun, poor light and parked cars. • At intersections, check for turning vehicles before you leave the kerb and while you are crossing the road. • Always supervise a child and hold their hand when crossing the road. • Never cross the road within 20 metres of a pedestrian crossing (except at the actual crossing). • Cross directly across the road and don’t stay on the road any longer than necessary. • Remember that drivers take longer than usual to stop in wet and slippery conditions. • Avoid using a mobile phone or portable media player (eg MP3) while you are crossing the road. These devices can distract you from checking for traffic. Penalties apply for both drivers and pedestrians who break the law. Most people who are pedestrians also know how to drive, so presumably they have at one stage read the rules of the road, so why do they persist in just plunging onto pedestrian crossings with reckless abandon? I nearly hit someone today who was listening to something on his iPhone while texting. He didn’t even walk straight onto the crossing – he approached it at an angle then proceeded to walk adjacent to it, texting the whole time. I nearly hit him and the person coming the other way nearly hit him. If I hadn’t been on my way somewhere I would have done a U-Turn and shoved that blasted iPhone down his throat. Now I think that modern technology is great and all that and it must be so validating to be receiving and sending text messages 24 hours a frigging day; but don’t you think it’s more important to get across a road, a main route to the city, without ending up mangled under a car? Society’s dependence on hand held devices is actually beginning to drive me crazy. Put the blooming things down, people. You are missing seeing the way the leaves on the maple trees rustle in the wind and the striking, uplifting colour of the sky. And mostly, if you are texting while crossing the road and have your headphones in so you can’t hear a thing around you; you are going to cause an accident. My neighbour asked if she could catch a ride with me into the city the other day and as we were driving along the main route there she became very nervous as we approached a particular pedestrian crossing. She held onto to the seat and closed her eyes. ‘Tell me when we’re through,’ she said, rocking slightly in the seat. Turns out she is suffering from post traumatic stress disorder as a result of hitting someone on that very crossing. You won’t be surprised to know he was a young guy – only 22 – with an iPhone, listening to music, texting and crossing at the same time, without checking the road once. My neighbour heard a sickening crunch when she hit him and thought he’d gone under the car. But in what (to me) is an almost hysterically funny example of poetic justice it was his iPhone that went under the car and it was it being smashed to smithereens that she heard. The iPhone guy wasn’t hurt but became very aggressive as he and my neighbour were waiting for the police. He punched her in the chest and knocked her down. Three witnesses saw him walk onto the crossing when my neighbour’s car was already on it and confirmed it was almost inevitable that she hit him. They also saw him punch her in the chest. When the police came he was in a bit of a rage and they carted him off to the cop shop. The whole thing went to mediation and the magistrate ruled the pedestrian was in the wrong and was fined $2,000. My neighbour decided not to press charges for the punch but hasn’t been able to drive since it happened (3 months ago) because she is so worried she will hit someone else. I feel really bad for her. I can see how much it has affected her. It’s how much worse it could have been that haunts you after an accident. It really does cause a lot of stress. I hope that hand held device users become more responsible on the roads, that they remain aware of their surroundings and above all, realise that Playing In The Traffic is not the newest App on their iPhone. I feel sorry for your neighbor…I am surprised when I watch drivers and walkers around my area…the other day I saw a driver texting with both hands while using his knees to keep the car straight…rather insane. My neighbour is really stressed, slpmartin. I feel sorry for her too. That driver you saw is beyond belief. I can’t get my head around behaviour like that. When I was in hospital I saw some terrible accidents come in. I just don’t think you should take the power of a car coming at you at speed lightly. It’s scary stuff. I haven’t had any close encounters with pedestrians, but many with other drivers who have a cell phone to their ear or are texting. It’s insane, as slpmartin says. I don’t understand it, Patti. Surely no call is that important that you can’t wait till you’re no longer driving. it’s incredibly dangerous. I am constantly amazed by how careless and stupid some pedestrians are. I feel sorry for your neighbour, that must have been a really difficult experience. It annoys me to see people walking and texting, it is happening everywhere, always the young adults, it is so dangerous, and I don’t think they realize just how dangerous. I can only shake my head when I see what I assume is friends walking together, but each too busy on their iphones to even talk to each other. I completely agree with you, Mags. So many of them don’t look as they are crossing the road. If a drunk driver was heading towards them it would be all over. It worries me a lot. wow. it makes me ill, almost everyone on the train is holding or staring at a phone. The magistrate ruled the pedestrian was in the wrong? Bloody hell, the world is coming to an end! Usually, it’s the driver who gets the cane … I once clipped a drunk who staggered in front of me on a main road … thank God there was nothing coming the other way, or it would have been ‘Goodnight Irene’ for him! BUT … I still got guffed for ‘careless driving’ and fined £25. I had to laugh last year, though, when some feckless youth rode a mountain bike across a pedestrian crossing (illegal) right in front of a truck. Goodness knows how the truck stopped in time, but he did, and, naturally, gave the cyclist an angry blast on his air-horn. The cyclist turned to give the driver the finger … and rode straight into a pillar box! I nearly fell over too when I found out the pedestrian was charged. I think it’s because he had such a bad attitude – apparently he was texting during the hearing. Some people are beyond help. That cyclist driving into the pillar box is totally slapstick. I hate to say it but it sounds like instant karma to me. Sorry you got charged for the drunk guy being reckless. It’s a crazy, mixed up world! It’s so important, Rachel. I see some of my son’s friends just bounding across the road without looking and they should know better. The roads are just getting busier and busier in the cities…. We see it alot here too Selma. People darting out, all dressed in black at night or in theearly morning hours. They just expect you’ll see them when the reality is that until they’re in the headlights, they’re invisible. I don’t know why people think they’re highly visible, Cathy. Often they are in front of me before I know it. I have seen some terrible accidents lately. It worries me – people are so careless these days. I don’t have a cell/mobile phone. I’m not actually anti them I just wish people would use them more sensibly. And I know what you mean about texting – I don’t know how people can walk and text at the same time. I am far too uncoordinated for that! I feel terrible for your neighbor! I feel bad for her too. She is still pretty shaken up. Poor thing! I got rid of my car a number of years ago when I moved to the core of the city, and it didn’t take long for me to gain a heightened sense of awareness of what it means to be a pedestrian in a place full of motorized vehicles. I have almost been hit a number of times. I have learned to be very careful, and I have learned to follow the rules and to never assume that a driver will see me. Because yes, it’s MY responsibility too. And when I do drive, I dread being in the midst of the city because there are so many pedestrians walking unawares – many checking their facebook statuses. Your poor friend. What a nightmare. In Toronto we have dedicated pedestrian crossings, with a flashing light that is engaged when a pedestrian pushes a button. The problem is, I’m very careful using them because they’re unique to Toronto and people from outside the city might not know what the flashing orange lights mean and sail right through! I am a pedestrian much of the time too and realise how dangerous it is crossing the road. I would never even consider crossing while texting and/or listening to music. I think there’s a degree of recklessness on both sides these days. I don’t know why. Patience seems to be a problem for a lot of people. They just can’t wait even for the 10-20 seconds it takes someone to cross the road. I don’t get it, Jen. At all. What an idiot that guy was – your poor neighbour. Imagine what it will be like when most of the cars are electric and really hard to hear – eek! I know. It’ll be crazy. Maybe we should go back to the horse and cart instead. Haha.